Surrounded by greenery lies this unique little forest house, offering magnificent views across the Frisian fields. The quiet village of Donkerbroek has a small grocery store and a place where you can rent bicycles to explore the natural surroundings. 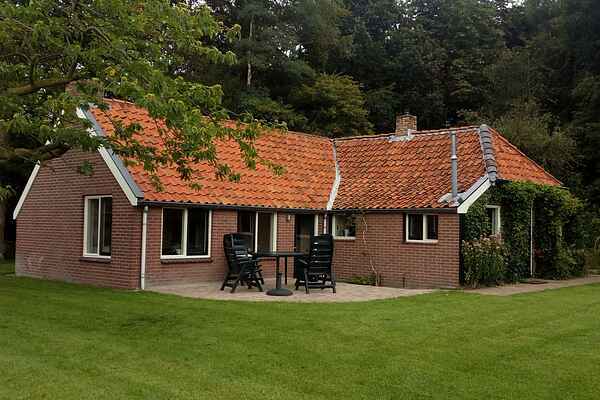 The village is situated in the triangle formed by the towns of Drachten, Assen and Heerenveen. This unique and basic forest farmhouse was built between 1906 and 1930 and is located in a quiet street. When you enter the house, you'll immediately feel the homely atmosphere. The house is fitted with two gas heaters. In addition to the master bedroom, there is a mezzanine, which is a nice place for the kids to sleep (please note: steep staircase!). Your terrace offers great views across the fields. There is a meadow where the kids can play football. If you're looking for tranquillity, space and plenty of privacy, then this is a wonderful place. Perfect for getting away from it all! At the point where the forest starts, you'll be amazed by the Frisian landscape. Forget about the clay soil, large lakes and flat fields, and discover this wooded area with sandy grounds and two National Parks. This region is called Friese Wouden and the town of Appelscha lies in the heart of it. Cycling, walking, a round of golf or a visit to Duinenzathe amusement park; there's something here for everyone!